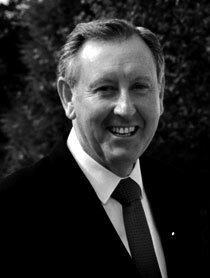 Few Australian businessmen of the last generation have been so admired and respected, or so popular with peers and employees, as Kevin James Kirby, AO, who died at 74 after a brave battle with cancer in 2002. Kevin Kirby’s remarkable business career extended more than 50 years and was notable not only for his leadership in the manufacturing industry, but also for his great community-minded generosity. After leaving school, Kirby studied metallurgy at Sydney Technical College and joined James N. Kirby Pty Ltd in 1946. His father had founded the company 20 years earlier and before World War II it was mainly involved in automotive and aircraft engineering services. During the war it produced armaments and engine parts. Kirby and his younger brother, Raymond, gained experience on the factory floor, followed by major plant management responsibilities. They were fast-tracked and mentored by their father, later to become Sir James Kirby, when Kirby’s became one of Australia’s leading industrial enterprises. By the time Sir James died in 1971 he had groomed Kevin to become chairman, and Raymond to become managing director of the Kirby Group of Companies. Together they led the organisation into its next phase of development. Kirby’s became a manufacturing leader in all kinds of fields: consumer durables (such as refrigerators, washing machines and freezers); electric motors of all shapes and sizes; radios and television sets; automotive parts (such as steering systems and carburettors); many plastic moulding and extrusion products and a range of top-of-the-line machine tools. During the 1990s, as the onset of globalisation and the impact of sharply reduced tariffs became clear, the brothers planned for rationalisation and the sale of various parts of the business. Sales were made to several international partners who knew the Kirby business, and, where practical, former Kirby divisions continue to operate in their existing production plants. Kevin’s business leadership contributions, however, extended beyond the family companies. He received numerous invitations to take up public company directorships. At various times he was chairman of Metal Manufacturers, of Simsmetal, of Rolls-Royce of Australia, and of Air Liquide Australia. He also served as a director of ACI International, of Atlas Copco, of Fisher and Paykel, of Imagineering and of Barclay’s Australia. With good reason, he was recognised as one of Australia’s leading non-executive directors. As one who served with him on three public company boards, I can attest that he was indeed one of the very best directors around. His integrity and straightforward questioning were always refreshing, always reassuring. He always focused on issues that really mattered. He was firm but fair, and fully understood the meaning of shareholder stewardship and accountability. A further dimension of the Kevin Kirby story takes us well beyond industrial leadership. He was community-minded and contributed his time as well as his money to many worthy causes. Most importantly, he was chairman of the James N. Kirby Foundation, established in 1967 by Sir James. Kevin and Raymond nurtured and extended the foundation’s outreach in an admirable manner in the 30 years since their father’s death. The foundation has a special interest in young Australians and makes a number of grants to organisations providing services for children of all ages. Major grant recipients last year included the Children’s Cancer Institute of Australia, St Vincent’s Hospital’s bowel cancer screening unit and also its oncology research group, the University of Sydney’s dermatology research laboratory and its faculty of education’s children’s centre (which helps parents and teachers of children with learning difficulties), the Australia Ballet’s First Impressions program for introducing children to ballet, the Australian Youth Orchestra, the Brotherhood of St Laurence, the Red Cross, the Salvation Army, Barnardos and the YWCA (providing its abuse prevention education program for schools in the Bowral and Shoalhaven regions), the schools program of the Wheelchair Sports Association of SA, the sibling support program of Very Special Kids, the Australian Outward Bound Foundation and St Philip’s College in the Northern Territory – an outback community high school. Kirby spent a lot of time meeting and visiting beneficiaries of Kirby Foundation funds, especially in later years. He was also a great supporter of many charitable institutions. A partial list of active involvements includes the Heart Foundation, the Salvation Army Red Shield Appeal (and its advisory council), the Sydney Legacy Torch Appeal, the Sir Robert Menzies Appeal Trust, the Benevolent Society and the Dementia Centre. Kirby didn’t like fuss, but happily he was recognised for his contributions and achievements in a number of appropriate ways. He was made an Officer of the Order of Australia in 1986. The Institute of Production Engineers made him a Companion. The University of NSW gave him an honorary doctorate of the university, while the University of Technology, Sydney, made him a fellow, both recognising his commitment and support for professional education and training. The Heart Research Institute bestowed an Honorary Fellowship upon his passing. No account of Kevin Kirby’s life would be complete without mentioning his love of sport and his sporting prowess. While still in primary school, Kevin gained fame as an awesome, fearsome fast bowler. There is a legendary tale told about the young tyro bowling for Mosman Prep against Rose Bay Christian Brothers and taking seven wickets for two runs. The two runs were allegedly the result of a misfield by someone who became a lifelong friend, Bob Blanchard (Kirby was very forgiving). Kirby attended secondary school at Shore and was a member of the First XI for three years. He was selected in the Combined GPS XI for two of those years. He subsequently played one game at state level, but a serious back injury cut short his career. After that he pursued the more genteel game of golf and excelled there also. He became Manly club champion for three years running and he won the NSW junior state championship in 1947. In later years he became president of the Australian Golf Club, and was inaugural president of the Australian Golf Club Foundation. Kevin Kirby’s sunny personality and goodwill towards people in all walks of life attracted a legion of friends through the years. His children tell of bets they had among themselves, based on “how many people Dad would know and greet” when they went to a restaurant or function. For all his activities in the wider world, however, Kevin’s home was his castle. While he played golf with a host of friends and celebrities, his favourite golfing partner was his wife, Ann. Ann and Kevin were married for more than 48 years. With their three children, David, Margaret and Helen, and their spouses, the Kirbys were a close-knit group. Their six grandchildren have provided special joy in recent years and the whole family gave wonderful support and comfort for Kevin in his difficult, final 12 months. Kevin Kirby’s concept of business leadership differed sharply from many media headlines about so-called business leadership today. He thought leadership was a privilege which carried great responsibility – not least, to give something back to the community and to help make Australia a better place. We need more business leaders such as Kevin Kirby.